Hunting can be a fun filled recreational activity and a kind of interesting outdoor sport. People go for the hunting of deer, squirrels etc for the sake of recreation, getting food or trade. Hunting has been extremely popular since centuries. Squirrel hunting offers the same pleasure just like any other hunting experience. If you wish to enjoy this experience, some squirrel hunting tips will be surely helpful for you. Squirrel hunting offers good opportunity to develop woods hunting skills. Squirrel hunting is tricky and it needs a great skill. First of all, you need to find out the location where the squirrels are abundant. If you can find the squirrel food, you will be able to find the squirrels. Squirrels generally like to eat nuts and they can be found high in the trees cutting the nuts. Your shotgun may not reach to that height. Hence, you will have to wait until the squirrel comes down on the ground to collect the nuts. The important squirrel hunting tips suggest that you should have a lot of patience and plenty of hunting time. You will be able to find abundant squirrels in the cornfields, as they are fond of agricultural crops. The best way to locate excellent squirrel woods is to go for camping, hiking or fishing and keep your eyes on nests and gnawed pinecones, nutshells or corncobs indicating the existence of squirrels. Once you locate the spot and the season for hunting opens, you may get dressed in comfortable clothes and get ready for squirrel hunting. Early to mid-morning and mid to late afternoon hours are always found to be more productive. 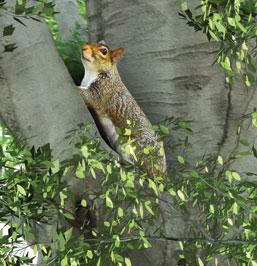 Most squirrel hunters prefer to use a shotgun or .22 rifle, which enables you to shoot the running animals. Most hunters use the hard-hitting hollow point bullets for the moving animals. You should not try to shoot unless you are confident about a quick kill. You may apply the technique of still hunting which involves moving quietly and slowly through the woods, stopping at likely spots for about half an hour and keeping your eyes peeled. You may use a call for locating your game or take the help of trained squirrel dog. You can wait for about 30 minutes after shooting 12-gauge shotgun before the squirrels come out of hiding. Situate yourself under the oak tree or any other suitable food source and then get ready for the action. One of the important squirrel hunting tips is that you should be very patient. If the squirrels are hiding on the other side of the tree, then you may throw small projectiles on that side. On hearing this sound, the squirrel will switch the side and relocate itself on your side. Now, you can have a better shot at your target. After hunting the animal, it should be kept immediately in cool, dry place.